The forecast was not looking good for the Far West. With races on the calendar for early December, it was time to think seriously about early season training opportunities. You don’t have to look far to find a plethora of options at Copper Mountain, Colorado. 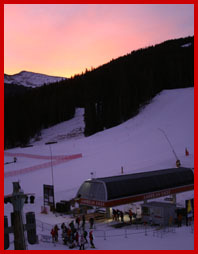 Copper is ski race central during the month of November. Everyone from mini J6’s to U.S. Ski Team and international ski team athletes are running gates on Copper’s pristine early season snow. 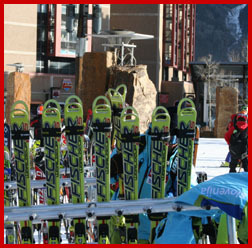 Many ski clubs and teams head to Copper Mountain as an organized group, but it is also the hotspot for commercial ski camps such as Sports Club International, Olin/Lacasse, NASC, (National Alpine Ski Camp), and U.S. Elite Camps during Thanksgiving week. The camps attract all levels of racers from mini gate bashers to elite level athletes getting their game on. Copper Mountain allocates two sections of the mountain for gate training and assigns two to three hour blocks for each group. Training starts at sunrise and goes until the mountain closes. Racers alternate running gates with drills and afternoon dryland sessions. It’s a great jumpstart to the season both physically and mentally. There’s nothing like running slalom on a course right next to Lindsey Vonn. The women’s U.S. Team was in town for a few days before the Aspen downhills. Star struck girls in tiny Spyder suits gathered around Vonn for autographs. The Slovenian team was on lane 1, in their bright blue suits, and man they were fast. Factor in teams from Japan and France, and it was international ski race training at its best. 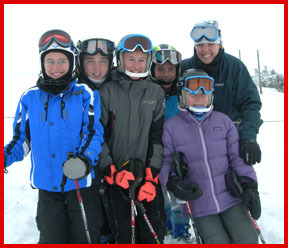 If your idea of Thanksgiving does not entail sending your young racer off to ski camp, you might consider one of the "family camps" offered during Thanksgiving week. The whole family gets a chance to spend some time on the snow, your youngster gets gate training, and you get to go out for Thanksgiving dinner! Sports Club International offers such a camp. 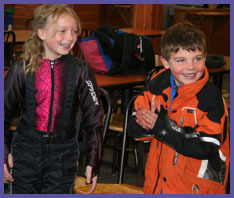 Family oriented, the camp accepts racers ages 8-15. Parents are invited (and expected) to be on hand to watch and participate in their child’s progress. The camp rate includes accommodations (and breakfast) for both racers and parents. Families stay in Copper Village’s slopeside condos which are conveniently located with easy access for kids on the run. We had a chance to test drive the Sports Club International camp and were quite impressed. Coaches were well trained (many are ex-USST members) in race technique, but also in how to interact with young children. Gate training was emphasized, but free skiing and drills were also a big part of the day. Groups were extremely small, allowing coaches to give individual attention and focus on each racer’s strengths and weaknesses. Campers got five days of slalom and giant slalom training. Some sessions included early bird gate training (think pre-sunrise). I expected to hear some whining about the early hour, but it was presented as an adventure by nurturing coaches, and thus it was indeed an adventure. Gate training was peppered with lots of creative drills with an emphasis on fun. After the short week of training, group members bonded and presented a skit for parents. In return they received mini diplomas and a skill sheet on goals that were accomplished. It’s tough to know how much a ski camp really helps a young racer. But I can tell you this, after just five days of training and awesome coaching, my daughter improved her technique and attitude fivefold. She hit her first race in December earning a front page result and the willingness to work hard all season to reach the podium. And as a family, we had some bonding time on the slopes. It’s tough to do once the season gets rolling. And the Copper Village was a pretty cool place to hang out. There are a variety of restaurants and shops to keep you busy. We nabbed a slopeside condo, with views of the plaza and the slopes. With digs like that you don’t even need to leave the room to catch the action! November can be iffy on snow coverage, but Copper starts making snow in September or October to prep lanes for international team training. They also had adequate coverage on some novice and intermediate trails which were perfect for drills and free skiing. Copper Mountain is also centrally located so if you feel the need to get out and explore while your racer is training, the cute towns of Vail and Breckenridge are nearby, as are hiking and biking trails from Frisco. For more on Copper Mountain see their website at CopperColorado.com. For more on Sport Club International’s Thanksgiving Camp see their website at SportsClubInt.com. *** Want more on winter family fun? Be sure to sign up for our e-newsletter to get the latest on winter family travel & gear deals, plus tips to make your life easier! Ollie in! JOIN THE RIPPIN’ RIDERS TEAM!!! . If you rip.. or want to... be a product tester. Join the Rippin’ Riders Team for deals, discounts, and first shot at testing new product.